London Cross table lamp. Rustic style. Buy luxcambra online. LONDON CROSS it is Table lamp with a very elegant design, finished in rust. Lampshade of beige sacking, brown sacking in two finishes (beige and brown). Adjustable in height and position, perfect for lounges, desks, reading points, as well as for lighting bedside tables in rustic bedroom headboards. Dimensions: Height 55 cm. Lampshade cone 25 x 16 x 12 cm. - Light bulb: 1 x E27 40W MAX (not included). 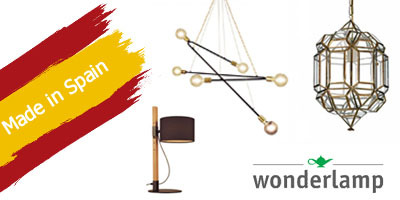 We present you the lighting products Made in Sunny Spain that recognised and appreciated for the high quality, excellent design, uniqueness, fair trade production, authenticity, advanced technology, high security standards, status symbol, sustainability and good value for money quality. This is the best selection of brand products that are manufactured in Spain and have a differentiating and trendy design. They are internationally recognized and awarded in various professional forums, they respond to the diligently to give the best service to our customers.